Shore excursions, cruise tours and ship trips to Cairo from Port Said, Enjoy visiting Giza Pyramids of Cheops, Chephren and Mykerinus. Then discover the First Step Pyramid of King Zoser at Sakkara from Vessels arriving Port Said Egypt (Private Tour). Egypt Travel Representative will pick you up from Port Said port by the cruise exit door, holding a sign of your name. After that you will be transferred by an air-conditioned vehicle to Cairo, approximately 3 hours, joining a police convoy till arriving cairo. 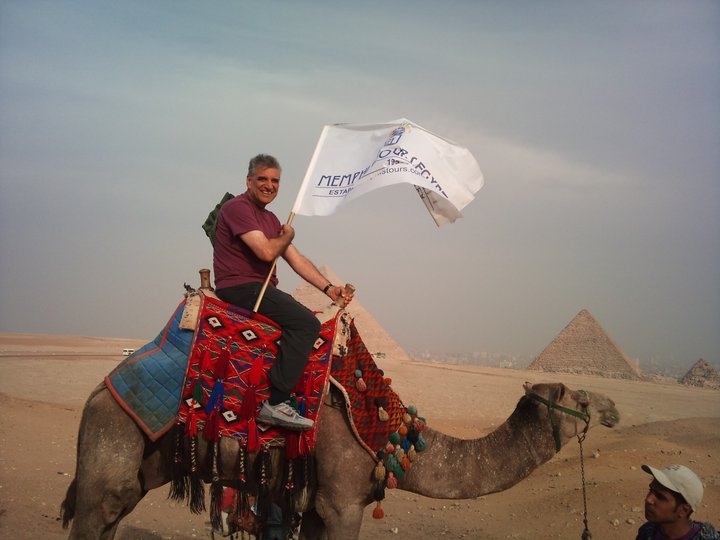 Enjoy a tour to Egypt's Great Giza Pyramids. Get excited by a camel caravan ride in the desert. Continue your excursion down to the Valley Temple, then visit the great Sphinx. After lunch at a local restaurant, move to Sakkara, Egypt's oldest ancient cemetery where you can see the world's first monumental stone building, the Step Pyramid of King Zoser, built by the engineer Imhotep. Enjoy also visiting one of the magnificent Mastabas (burial chamber) of either Ptah Hotep, Idut or Mereruca. Before beginning your return trip to Port Said a short stop will be made at a Papyrus Institute where you will have the opportunity to shop for souvenirs.